With thunderstorms coming up in the forecast, we set out to get some more of the low-water work done before the bayou jumped back up from 5-1/2 feet below the bridge. Turns out, the day had a few surprises in store. We arrived at Highland Road Park about the same time as usual, having stopped on our respective ways to vote in the BREC funding renewal election. The morning was slightly cool and quite pleasant, and we set about getting ready for working the bayou. The entry was about normal for low water — the drop is steep, but the footing isn’t terrible. 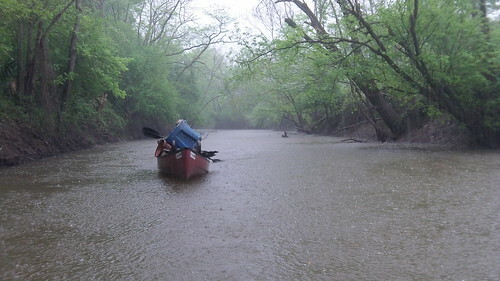 If there’s a hard part, it’s keeping the canoes from rolling over as they bow floats and the stern slides down the face of the bank, but we’re getting pretty good at keeping everything dry. You know, it really loses something in translation. You’ll just have to go out there and see for yourself if you want to be at all impressed. Anyway, we continued working our way down the bayou. We’d decided to tackle more of the potential trouble spots we’d been skipping due to more pressing locations, and around a mile and a half down from the park we came to the next set. Some branches, a long-lying downed tree, and the associated logs took a bit of trimming and just one winch set, and after a mere hour of work there, we continued on our merry way much more content in the state of that particular snag. 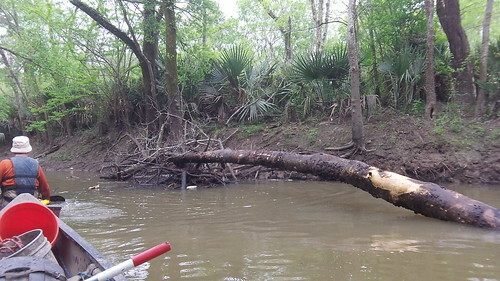 Right around mile two, we spent half an hour cleaning up a bit of wandering wood at #11, which continues to be the most unstable area along the bayou. It wasn’t jammed, but it still shifts a bit and sometimes loses waterlogged bits. With the large amount of rain in this weekend’s system, there’s a good chance we’ll get to revisit it yet again. On the one hand, it would be quite nice if it would settle down already, but on the other hand, it keeps shrinking with every log it loses. Eventually, it may be small enough to lose its status as a major collector. That would not sadden us. Which brings us to this photo. Sometime in the last week, a dead tree trunk that had been upright in the bank finally gave way. 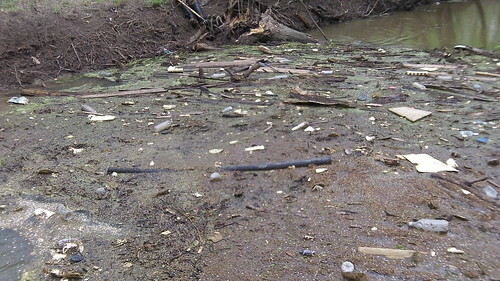 It had formed a new raft of flotsam, the largest on the bayou from the park to Bayou Manchac. On the one hand, there’s still all too much litter in there with the small logs, duckweed, pollen pods, and general bayou mulch. 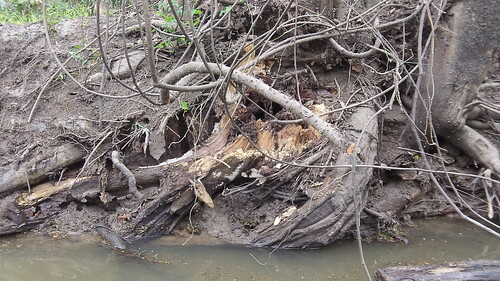 On the other hand, when we started there were *24* blockages, including a solid 65-yard section of logjam and flotsam. Something like this you can clean up in no time flat, and you can easily slide right through/over it in a canoe or kayak. We didn’t just slide by, of course. We broke out the winch yet again and got to work pulling the downed trunk out of the way. It was actually almost “easy”, considering the lack of branches and the like, and within the hour we’d reopened the path and had everything flowing again. It is inevitable that there will be the occasional tree fall in the bayou (when no one’s around to hear it), but if you ever encounter it before we get to it, please be the one to make a sound. Just let us know, and we’ll take care of it. Sure, we’re not exactly looking forward to what we’ll likely face after the next big named tropical system comes through, but we’re old hat at this now. With the way open (and a quick snapshot taken of the tree’s former spot), we continued along the bayou. Along the way, we relocated more than a few branches, limbs, and smaller logs that were catching things. No more real problem areas presented themselves. There was one more submerged trunk that didn’t even jiggle a bit when we tried to budge it. While it’s no problem at all at 5-1/2 feet below the bridge, it could eventually be an issue, so we’ve added it to our hit list. There was also one semi-floating long log that was now floating directly out from a bank, but there was plenty of room to pass by. We put it on probation, and if it continues to remain there and annoy us, it’ll go, too. We made it to Bayou Manchac just shy of 5pm, nine hours after we’d left the park heading downstream. It was a long and very strenuous day with quite a bit more heavy winch work than we’ve done in a while. 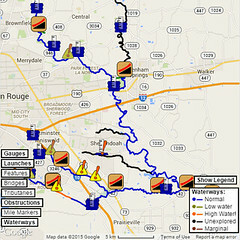 Of course, the true test of the bayou isn’t how long it takes us to work our way downstream. What counts is how long it takes us to get back to where we started. The current was a bit more than usual (but still all but negligible), and we were rather notably fatigued. Still, the return trip took a mere hour and 45 minutes to cover the four miles back upstream. It was another long day in an extended series of bayou work days, but we were productive as always. Mike collected a literal boatload of bulky items along the way. 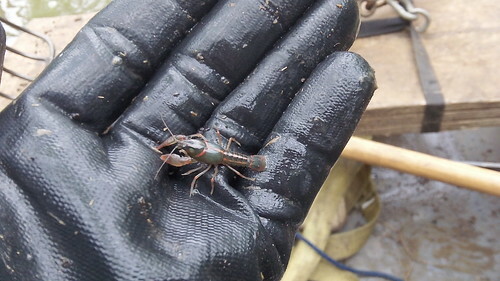 I found a cute little tiny crawfish wedged in a crack on a log I had just freed from the muck. (It had to come out for a photo op, as my camera wouldn’t focus in the crack.) The rain in the forecast didn’t arrive until we were less than a mile from the exit, and at that point it didn’t dampen our spirits one whit. (It may have rinsed us off a bit.) We ended the day much as we’d started, with optimism about the state of the bayou and anticipation of the upcoming cleanup (April 19th!) and future improvements. Until then, and we’ll be out there on the bayou again next weekend.